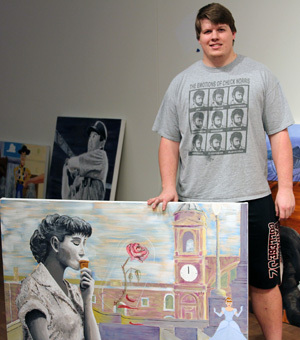 Four Wabash senior are wrapping up their careers as Wabash College art majors with the annual Senior Art Show. The show runs through May 12 at the Eric Dean Gallery in the Randolph Deer Art Wing of the Fine Arts Center. “The capstone is a directed creative process involving experimentation, research, critical analysis, writing and artistic production,” Professor of Art and Department Chairman Doug Calisch. “Collectively, these efforts move our seniors toward developing and refining a sophisticated body of work — a group of related artworks that are both technically accomplished and conceptually cohesive. Preparing for the exhibition requires the seniors to work together with the gallery director and collaborate on all details associated with the exhibition. 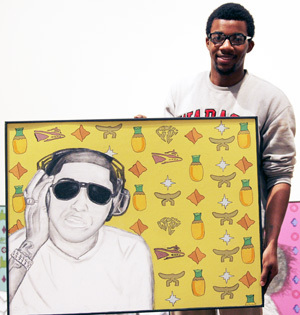 Patrick Alston’s mixed media work questions our cultural understanding of the American dream. Alston combines charcoal drawing, pattern, paint, and collage to illustrate common perceptions about living and working in America. 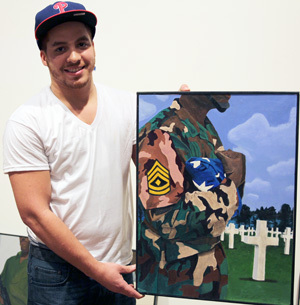 Joey Fogel showcases a series of paintings, “The Story of African-American Patriots,” in which each painting features a lone African American soldier. Fogel’s work gives new meaning to our perceptions of the soldiers’ experiences in the military. Fogel’s father, a war hero, served as the inspiration for these paintings. Sean Parchman’s digital photo collages reflect on the issue of identity. 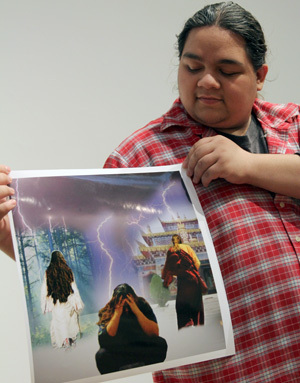 As a Native American who wants to be a Buddhist and a techno-geek who believes in classical ideals, Sean uses these four contradictory “center points” of his being as a basis for imagery and technique in his art. Chase Tichenor’s paintings combine popular movie characters from different eras, both real and animated, that share similar underlying virtues. When juxtaposed in the same environment, these movie icons point to Hollywood’s representation of the human condition across time.